As promised here is a post about how to create a simple client side Sitecore SPEAK pipeline. Firstly you check if the pipeline is already declared, and if not you create it. Declare the pipeline step by creating an object which has a priority property and an execute function which accepts a context variable. The execute function is the where you write the code for this step, in this case log “step 1” to the console, or abort if the context.hasRun == true. The priority property defines the sequence that the steps are executed in, and as I mentioned in my previous post this is not ideal 😦 but Anders and I had an idea how to solve this so please read this great post by Anders. But back to the point. If you want to abort a pipeline, you just have to set the property abort on the context to true, and then no more steps will be executed. 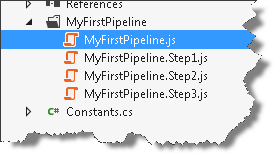 Its easy to add a step to a pipeline, you just call the add method. If you take a look in the Sitecore.Speak.config file in the include folder, you will see there is a speak.client.resolveScript section, which defines a server side pipeline that is responsible for resolving scripts. Category – used to match which source to use to locate files. Folder – the folder to search. Deep – should it search sub folders. Pattern – pattern to select files in the folders. This explains the mfp part of the base url (/-/speak/v1/mfp/) but what about the rest? The following setting specifies the prefix that should trigger the HTTP request customer handler for SPEAK. At last we are now ready to execute our pipeline, so we create the context, pass in the application and call execute. The context contains the pipeline specific information required by each step in the pipeline. The first time the pipeline is executed all 3 steps are completed. The second time it will abort at the first step as the context property hasRun is set to true. This entry was posted in Pipeline, Sitecore, SPEAK and tagged Pipeline, Sitecore, SPEAK on February 1, 2014 by Alan Coates.